...I'M NOT SURE WHY, BUT CHEESE MAKES PEOPLE HAPPY, TOO. WHENEVER SOMEONE TAKES A PICTURE, THEY SAY, "SAY "CHEESE"!" EVERYONE SAYS "CHEESE!" AND THEY SMILE. Birdy is a gelotologist, which she cheerfully tells us is someone who studies smiles and smiling. She points out that she herself can smile while doing anything--standing on her head, climbing a tree. Well, almost anything. Smiling is not likely while eating broccoli. Birdy may except eating broccoli, but she remarks that smiles make most things better. Even George Washington, with his dentures, a combination of carved hippo horn and cows' teeth, would have looked better if he had smiled for his portraits. Of course, smiles are not all-powerful. MY GRANDFATHER SAYS MY SMILE CAN LIGHT UP A ROOM. I WISH IT COULD CLEAN UP MY ROOM! But smiling can increase our endorphins, which can only improve doing chores, right? But even Birdy admits that there are times when smiles just don't come. IT'S EASY TO SMILE WHEN I'M GLAD. BUT SOMETIMES I FEEL BAD OR MAD OR SAD. MY SMILE IS SMART, THOUGH. IT KNOWS WHEN TO LEAVE ME ALONE...AND WHEN TO COME BACK. 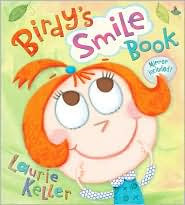 Birdy's Smile Book (Christy Ottaviano Books) (Henry Holt, 2010) Laurie Keller's quirky illustrations enliven what is actually a fairly substantial treatise on the smile, appropriately brightened with her cheerful heroine's wit and bright grin, even when her dog, French Fry, piddles on someone's stylish shoes. And who knows? Maybe Birdy's contagious smile really can spread all the way to Timbuktu. As a built-in bonus, readers can try out their own smiles on the full-page mirror at the end of the book. No smile? Just say "Cheese"!